Wendy Mao, a former CDAC graduate student now at Los Alamos National Laboratory, together with Ho-kwang Mao, Jinfu Shu, Russell J. Hemley (Geophysical Laboratory), Yue Meng, Michael Hu, Paul Chow (HPCAT), Peter Eng (University of Chicago) and Yong Q. Cai (National Synchrotron Radiation Research Center, Taiwan) have carried out measurements on H2O at high pressures. A remarkable, combined pressure and x-ray irradiation induced transformation in H2O transformation has now been documented. 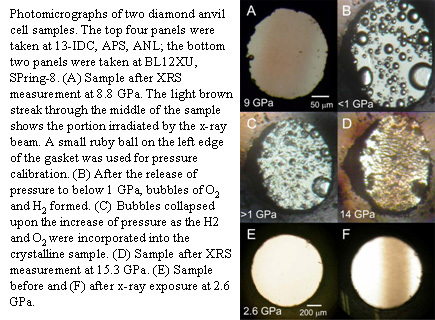 The combination of high pressure and x-ray irradiation leads to a cleavage of the water molecules and the formation of O-O and H-H bonds, converting the O/H framework of ice VII into a new molecular alloy of O2 and H2. X-ray diffraction, x-ray Raman scattering and optical Raman spectroscopy demonstrated that this new crystalline solid differs from previously known phases. It displays surprising kinetic stability with respect to pressure, temperature, and further x-ray and laser exposure, thus opening new possibilities for studying molecular interactions in the fundamental O2-H2 system. This work has been published in the October 27th issue of Science [W. L. Mao, et al., Science, 27, 636-638 (2006)].